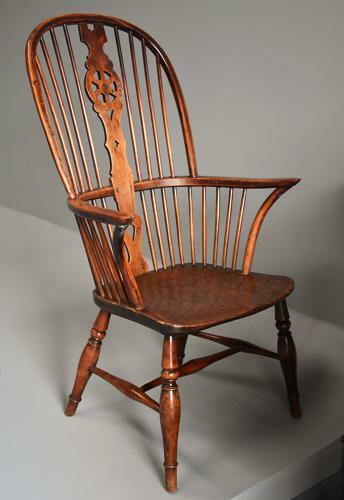 This armchair consists of a fruitwood back and legs with an exceptionally figured elm seat, the hoop back having a scribed edge supported by turned spindles with a pierced central splat with wheel decoration. This leads down to the arms, supported by crooked arm supports and turned spindles attached to the exceptional elm seat of unusual figured timber. The legs are turned and supported by an H-stretcher of elliptical shaped turned spindles. This chair has an old repair to the back on the wheel decoration, this has been superbly executed from metalwork. This armchair is in very good condition for age, is of stable construction and can go straight into a home.